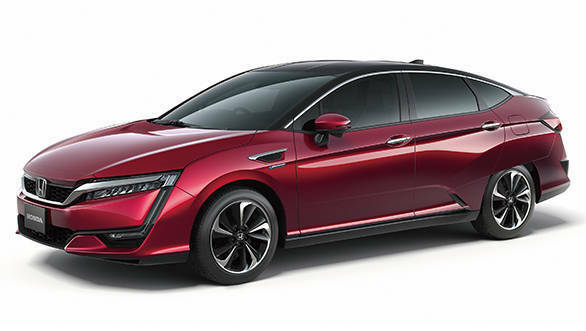 At the 2015 Tokyo Motor Show, Honda unveiled its new production-spec hydrogen fuel cell vehicle, the Clarity Fuel Cell. Honda says that the fuel cell on this car has been downsized by 33 per cent compared to the previous fuel cell stack, making it as small as a V6 engine. This is what made it possible to fit it into a sedan-sized car that seats five passengers. At the same time, Honda claims a nearly 60 per cent increase in power, to over 100kW, with an output density of 3.1kW/L. Maximum output for the motor in the Clarity Fuel Cell is claimed at 130kW. Honda also claims a 700km driving range from the Clarity Fuel Cell thanks to a high-pressure hydrogen storage tank that can withstand up to 70MPa. And it takes three minutes to refill. A unique feature on the Clarity Fuel Cell is the Power Exporter 9000 which, according to Honda, can provide power to an entire household for approximately seven days. This feature could be used as an emergency power source in the event of a disaster. The Clarity Fuel Cell will go on a lease sale in Japan from March 2016 at a price of ¥7.66 million (Rs 41.41 lakh), after which the car will be introduced in the US and European markets.